Lady’s finger is chopped up and cooked in oil along with onion. Plain yogurt is added as a finishing step. Serve lady’s finger yogurt curry with steamed rice or with roti. Makes: around 4 Servings of Bhendi Yogurt Curry. Wash and thoroughly pat the lady’s finger dry. Remove little bit of both ends and chop lady’s finger into small circles. When mustard seeds start spluttering, add chopped onion and green chiles. Fry till onion turns golden, then add the chopped lady’s finger. Fry briefly and cook covered on low flame for few minutes or until lady’s finger is just soft. Uncover, stir fry for a minute to evaporate any moisture. Stir in yogurt and fry on medium high till most of the moisture is gone. Serve bhendi yogurt curry with steamed rice or with roti. Notes: Make sure not to overcook the lady’s finger. Suggestions: If lady’s finger is not cooked well, put it back on heat and cook covered on low flame till done. Variations: Check other lady’s finger recipes here. Other Names: Bhendi Yogurt Curry, Bendakaya Perugu Kura. Lady’s finger is chopped up and cooked in oil along with onion. A freshly ground mixture of cilantro and coconut is added to the curry as a finishing step. Serve lady’s finger cilantro curry with steamed rice or with roti. Makes: around 4 Servings of Lady’s Finger Cilantro Curry. Separate leaves, wash and roughly chop them. If using frozen coconut, microwave for couple of seconds and keep aside. Using a mortar and pestle, grind the green chiles and salt first. Then add the coconut and then the chopped cilantro and grind into coarse paste. Alternatively, use a food processor to grind the herbs. When mustard seeds start spluttering, add chopped lady’s finger and onion. Fry briefly and cook covered on low flame for around 8 minutes or until lady’s finger is just soft. Uncover, stir in ground cilantro coconut paste and cook for another minute or two. 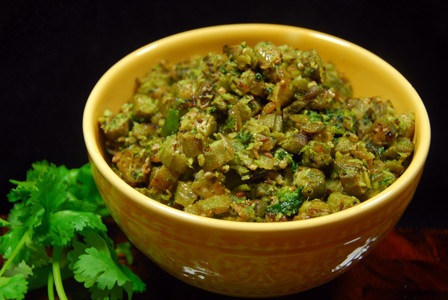 Serve lady’s finger cilantro curry with steamed rice or with roti. Other Names: Lady’s Finger Cilantro Curry, Bendakaya Kothimera Kura. Lady’s finger is chopped and cooked in oil and spices along with onion. The curry is seasoned with roasted corainder powder. Serve lady’s finger curry with steamed rice and dollop of ghee. Makes: around 2 Servings of Lady’s Finger Curry . Coarsely grind the green chiles and keep aside. When mustard seeds start spluttering, add chopped onion and lady’s finger. Cook covered on low flame for around 10 minutes. Uncover, stir in green chile paste, turmeric powder, coriander powder and salt. Fry for around 5 minutes and remove from heat. Serve lady’s finger curry with steamed rice and dollop of ghee. Notes: Make sure lady’s finger is cooked well. Other Names: Lady’s Finger Curry , Bendakaya Kura. Okra / Bhendi is washed and chopped. They are then fried in oil till golden brown in color. Fresh sesame seeds are ground into powder along with green chiles and tamarind and added to the lady’s finger as a finishing step. Serve lady’s finger sesame fry with plain steamed rice or with roti. Makes: around 4 Servings of Lady’s Finger Sesame Fry. Lady’s Finger (Chopped) 2 1/2 Cups app. Wash lady’s finger under water and pat them dry. Remove little bit of both ends and chop the lady’s finger into thick circles. Grind sesame seeds into fine powder using a spice blender. Now add the green chiles, tamarind and salt and grind again into powder. Heat oil in a pan, add sliced lady’s finger. Fry on medium – high flame till lady’s finger is golden brown in color. Stir occasionally to avoid lady’s finger from burning. In the middle of the pan, add all talimpu ingredients. Fry till urad dal changes color and mix everything. Stir in ground sesame seeds powder and fry for another minute or two. Adjust salt if necessary and remove from heat. 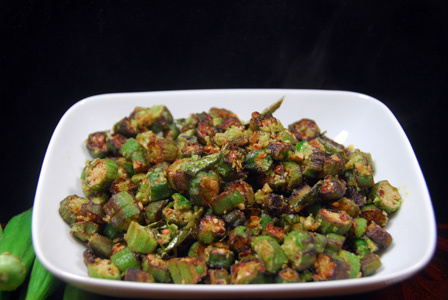 Serve lady’s finger sesame fry with plain steamed rice or with roti. Notes: Make sure lady’s finger is fried well. 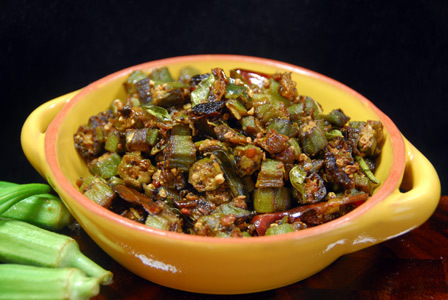 Suggestions: If bhindi seems uncooked, cook covered on low flame till done. 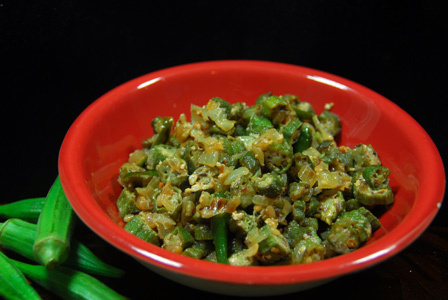 Variations: Check other okra / bhindi recipes here. Other Names: Lady’s Finger Sesame Fry, Bendakaya Nuvvula Vepudu. Spicy Deep Fried Lady’s Finger. 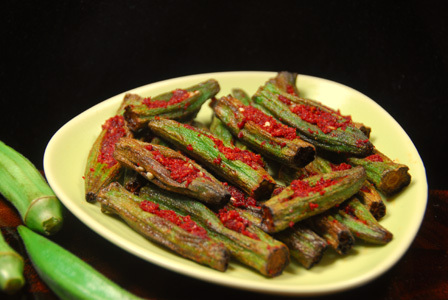 Lady’s finger / Bhendi are deep fried until light brown in color. They are then stuffed with freshly ground mixture of garlic and chili powder. Serve spicy deep fried lady’s finger with steamed rice and dollop of ghee. Makes: around 30 Spicy Deep Fried Lady’s Finger. Wash, pat dry and remove both ends of the lady’s finger. Make a vertical slit in the stomach of the lady’s finger making sure its ends are intact. Heat enough oil in a deep frying pan on medium low heat. Deep fry the lady’s finger until they turn golden brown around all sides. Remove the fried lady’s finger onto absorbent paper. Peel and grate the garlic onto a bowl. Add red chili powder and salt to the grated garlic and mix thoroughly. Stuff each lady’s finger with little bit of garlic chili mixture. Serve spicy deep fried lady’s finger with steamed rice and dollop of ghee. Variations: Check other variations with lady’s finger here. Other Names: Spicy Deep Fried Lady’s Finger.